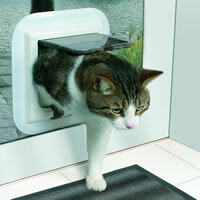 Offering a professional Cat Flap Service throughout Milton Keynes & surrounding area's. As Milton Keynes cat flap installers we realise that you, our customers don't want to have to wait for their cat flaps to be installed and as such we make great efforts to ensure that our glaziers can assist in getting your requirements completed within the shortest piossible time, generally in Milton Keynes a cat flap will take on average 2-3 working days to prepare as these would need to generally be inset in to toughened safety glass. Double glazed units, toughened glass and other non-stock items we offer an express service so that you, the customer, know that your repairs will be completed as soon as possible with minimum inconvenience. As Milton Keynes cat flap installers we also offer a first class glass, glazing and boarding service with clear or frosted glass, we are also able to provide you with FREE estimates and advice, supply and fit all types of single and double glazing, mirrors and roof panels.